...to those in the US. 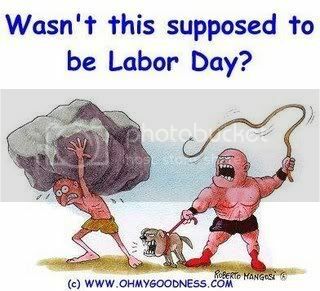 I hope you're all taking it easy and not taking the day literally as that picture depicts...LOL! Enjoy the rest of the day [night to some] everyone! Hey-I was wondering if you might help me with my blog...I went to Pyzam.com and found a template that I want to use. After I copy/paste the code into blogger and hit "save template" it tells me that "Widgets are about to be deleted" What should I do so I won't lose my Link List? I'm new to blogging and don't even know what a widget is! LOL! gee! I was right. hope you enjoyed the night. belated happy labor day, Juls. Got something for you in my blog. please come by to get it. take and hello to ur lil one. tell her she got a dainty pink fan. i love the color! We stayed home to Jul and had some friends over for small bbq dinner. it was sure fun than shopping! I'm so glad I stayed away from shopping mall.